Guardians of the Galaxy 17 was cover dated October 1991 and was on sale August 1991, sharing the spinner racks with Animal Man #40, Excalibur #42, Mask #1, NFL Superpro #1, Starman #39 and X-Men #1. 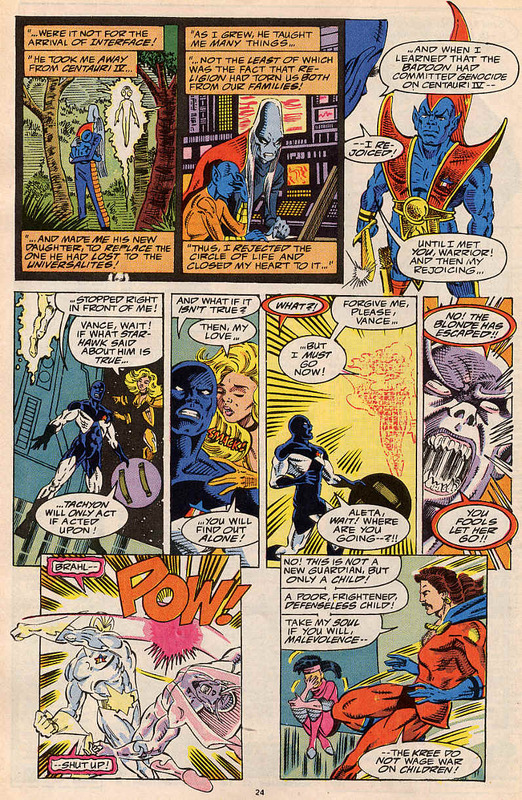 Homecoming was written and drawn by Jim Valentino and inked by Steve Montano and opens with a distraught Vance Astro demanding the immediate explusion of Starhawk from the team. There is no dissenting voice to this and Charlie-27, Nikki, Yondu and Vance all look at Martinex to make it unanimous. There’s a one page look through Martinex T’Naga’s thoughts in this, reminding us that Starhawk told Martinex that he would one day have to expell him from the team because of something that he’d do, but had no real choice in. Martinex realises that he too has no choice and agrees to firing Starhawk. 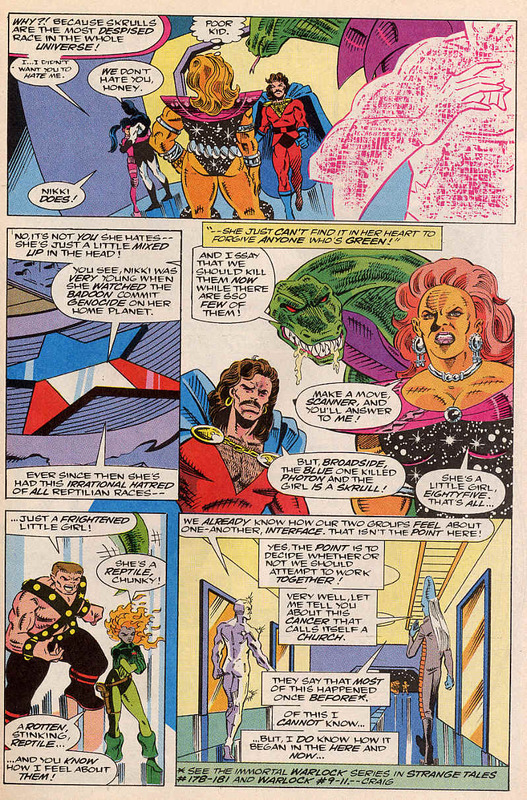 There is then a couple of scenes, showing Homeworld, where Protege orders his fleet to find Starhawk, while both Malevolence and Replica show their influence on him and then there’s a scene with Starhawk and Aleta struggling for control over their shared form, this time though, there’s a third voice. The Captain America II arrives at their home system. Enroute they see that many of Earth’s major cities are in ruins Sydney, Tokyo, Beijing and New York City as almost completely wrecked, but no sign of what had happened in the last 4 years. The team decide to check it out, with Charlie-27 changing into a more military outfit and carrying a cannon. Teleporting to Times Square, the team are almost immediately attacked by what appear to be 31st century versions of the Howling Commandos. From a vantage point a woman observes the team, recognising Yondu and by extension the Guardians of the Galaxy. This woman is Tarin, last seen in Marvel Two-in-One #4-5 when Captain America and the Thing travelled to the 31st Century to free New York from the Badoon. 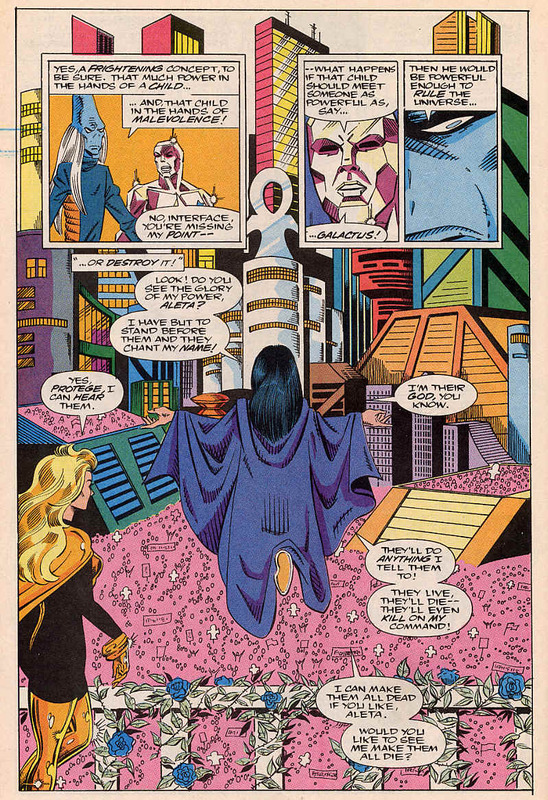 The two teams come to peace, they walk to the sub-basement of Avengers mansion and then the Guardians are told of the last four years’ events. It turns out that after Earth was freed, a new form of home entertainment called Realitee-Vee which had produced a narcotic gas and became so addictive, that the adults who survived the invasion just retreated inwards and died engrossed in this new entertainment. The younger ones formed gangs and started turf wars, with the most powerful being known as the Punishers. 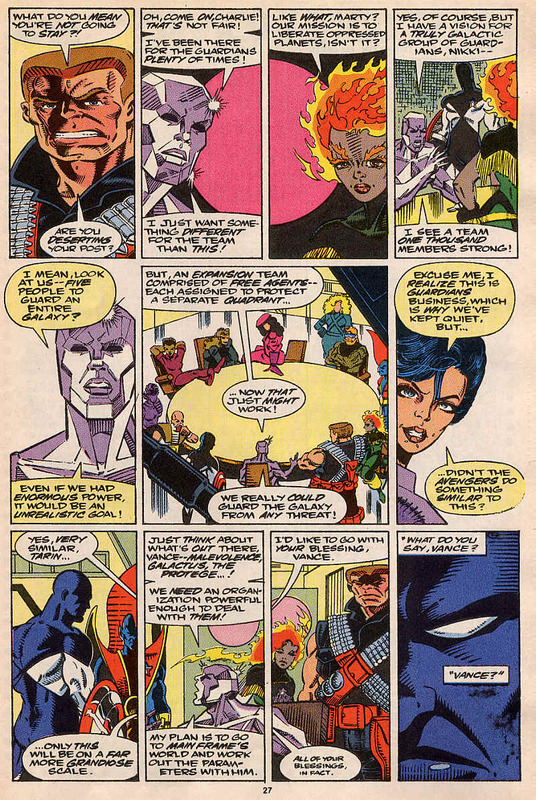 Vance quickly guesses that the only knowledge of the costumed heroes/vigilantes of the 20th Century came from him and immediately blames himself for the harm done. Choosing resolve over his old self pity, Vance decides to stay on Earth and deal with these two problems head on. The rest of the team decide to join him, all save Martinex. 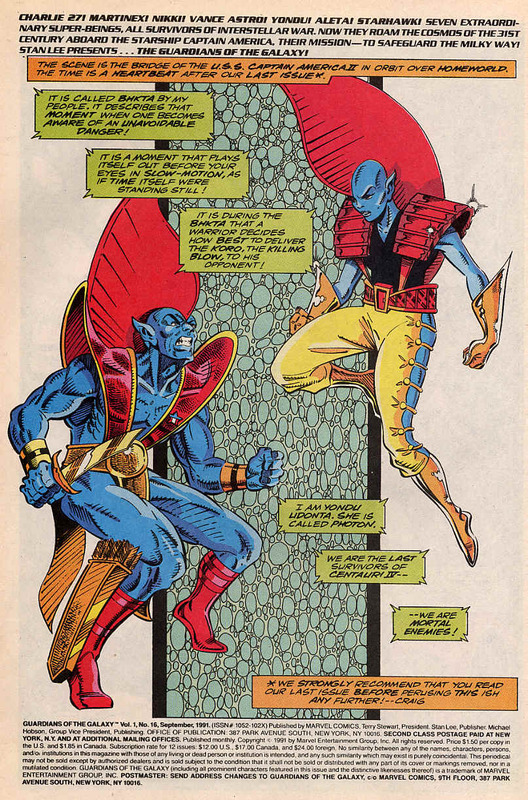 Martinex’s idea is for a larger group of Guardians of the Galaxy, with satellite branches similar to what the Avengers had done. Martinex abdicates his leadership role to Vance and leaves, the team wishing him well. 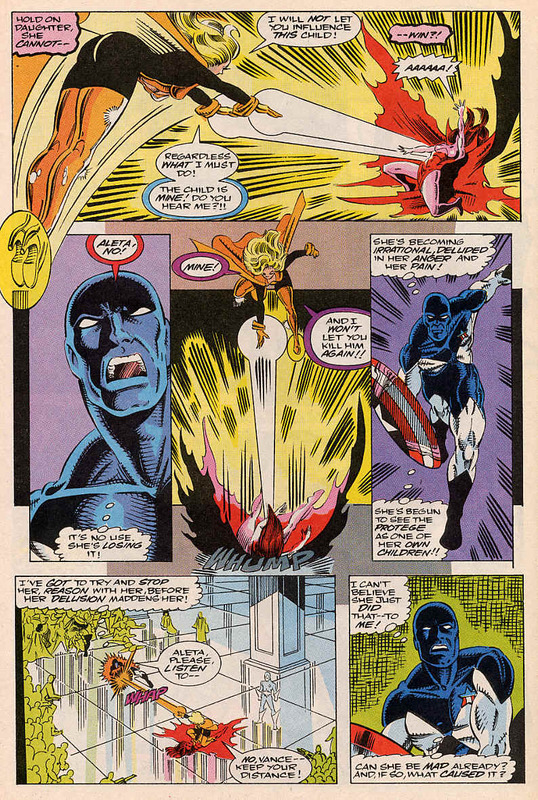 As the Commandeers and the Guardians of the Galaxy walk back out into the sunshine, Vance is targetted by the Punishers, who prepare to fire. Notes: This is a great new start issue, setting off a new era. This was a 90s staple. 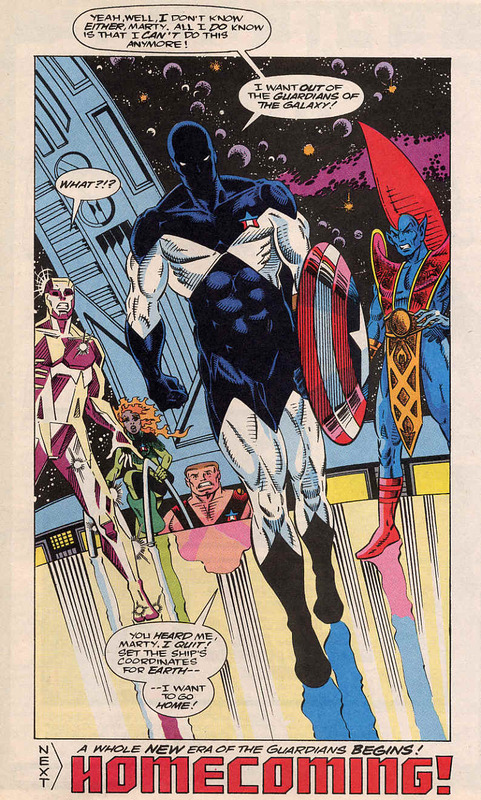 The last time the Guardians were on 31st Century Earth was in Marvel Presents #3 which is nicely recapped. 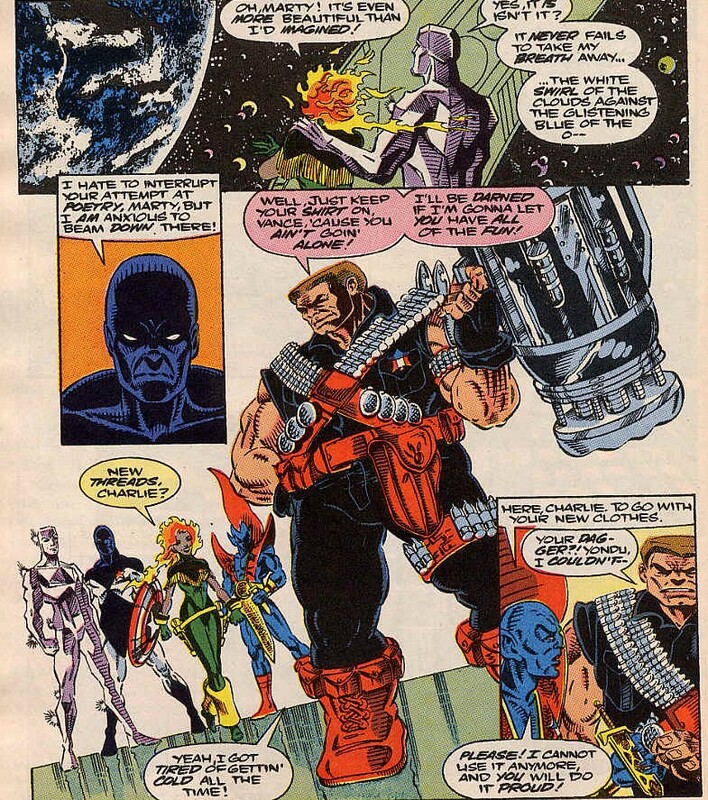 The Commandeers are very much based on the howling commandos, with Crazy Nate, Inez and Gabrielle being very close parallels, Tarin takes the Nick Fury role with Old Redd taking the Dum Dum Duggan role, but he’s most clearly based on Old Skull, a supporting character from the Killraven stories. Belle is a bit of an unknown here, much as the silent Hollywood. To be honest, they don’t really leave much of an impression and most have very little personality. 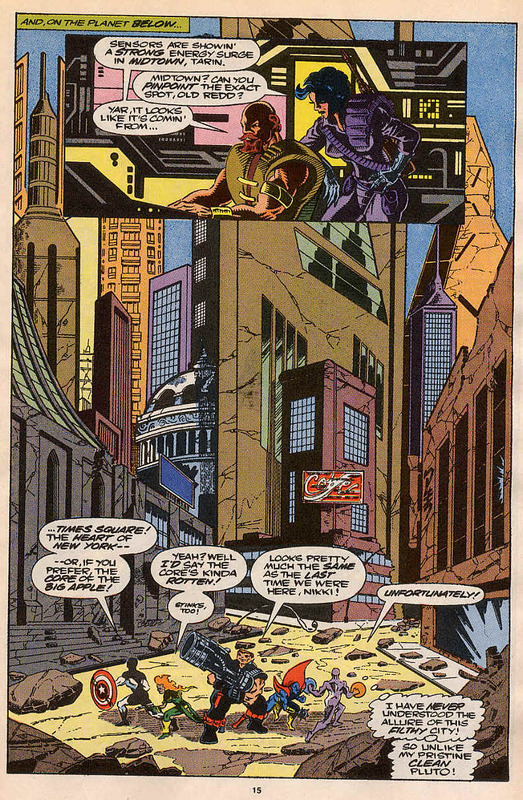 I like the fact that Earth has fallen apart so quickly after their victory over the Badoon, often wars of liberation are followed by civil wars as old rivalries are buried under occupation, but rise to the surface in the absence of a common enemy. I’m sad to see Martinex go, but he will pop back in from time to time, he is though, the first charter member of the team to leave, everyone else was a later addition. While not a fan of the Punisher, the costume does have an iconic look and works great for a villain. The art is as always fantastic and Vance, with a mission and once more command of the Guardians looks visibly different and that leads into a great little cliffhanger and an even better start to the next issue. Guardians of the Galaxy 16 was cover dated September 1991 and was on sale in July 1991, sharing the spinner racks with The Fly #1, Mighty Thor #436, New Gods #38, Sensational She-Hulk #31, Superman #59 and Wonderman #1. 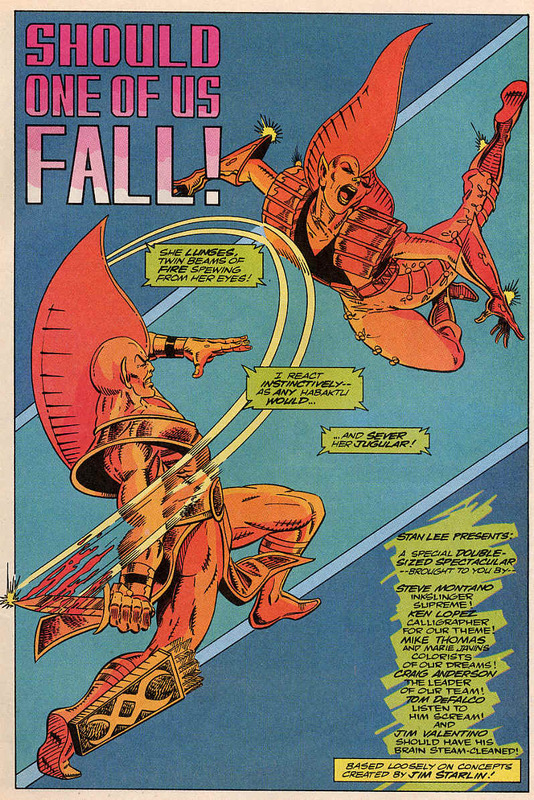 Should one of us Fall was written and drawn by Jim Valentino, inked by Steve Montano and inspired by Jim Starlin. 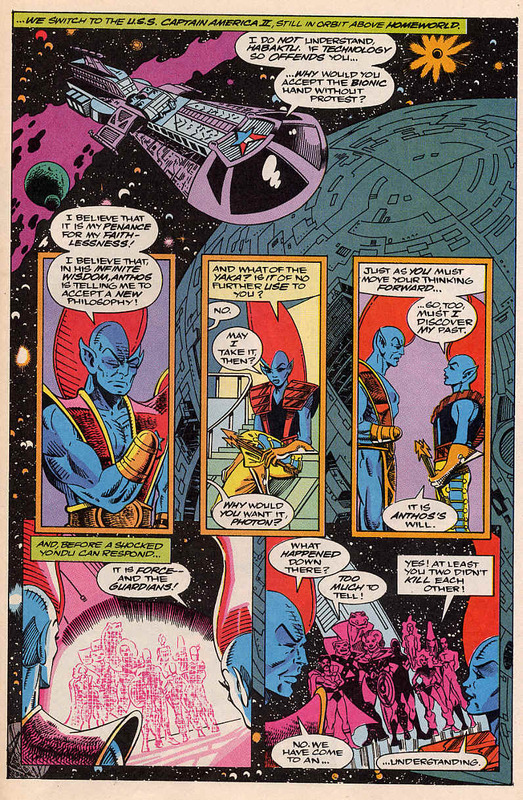 It opens with a tense stand-off between Yondu Udonta and Photon, the last known Centaurians in the galaxy. 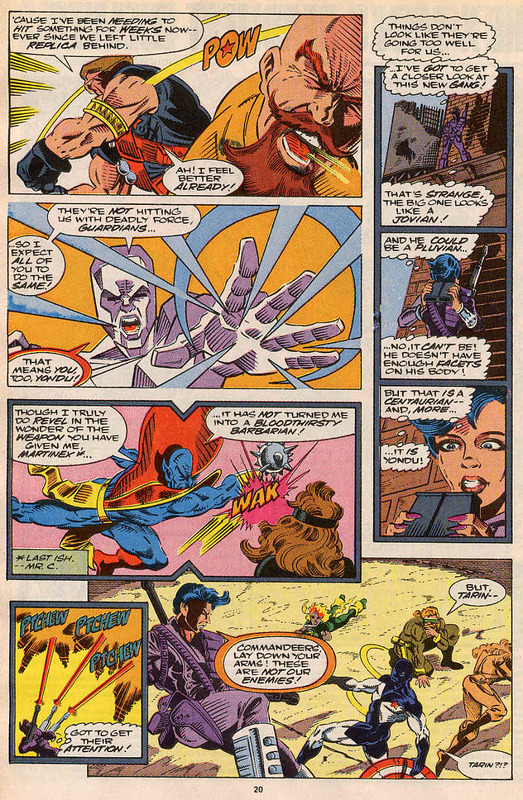 After an exposition filled staring competition, Yondu swipes at Photon and opens her jugular. And that is how this issue starts! 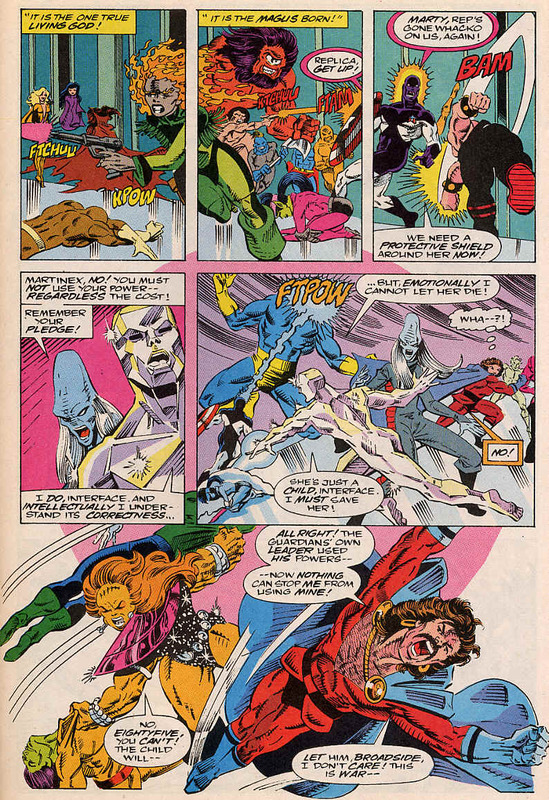 All the other fights brewing from the last issue pause as Interface rushes over to save her adopted daughter. She puts a cast over Photon’s neck and as Yondu tries to help, shocked and ashamed of what he has done, Interface reduces his hand to vapour. 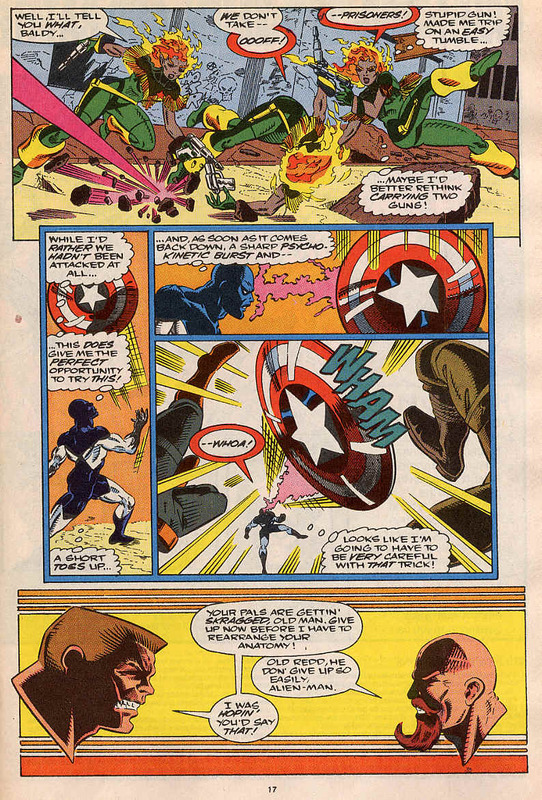 Martinex arrives and guides the three of them to the Captain America II’s sickbay. 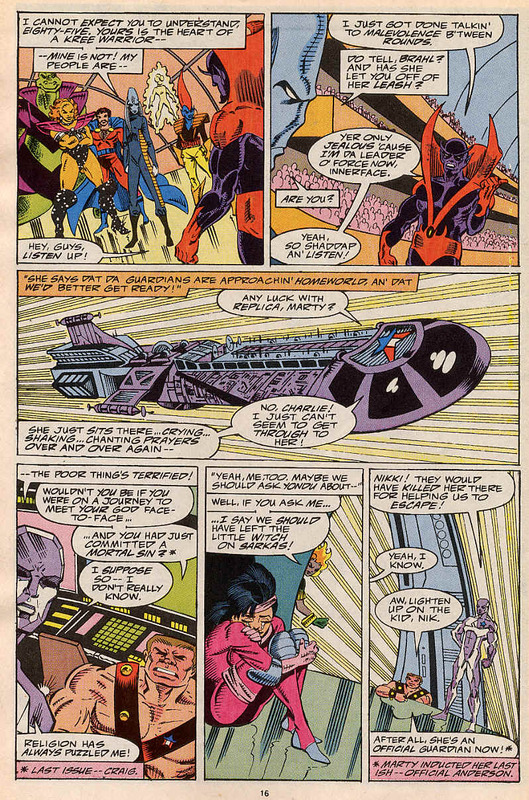 As this happens, Starhawk calms Eighty-Five and Replica, suggesting that they have to end the cycle of hate between the Kree and the Skrull. There is a truce on the ship and on Homeworld, Aleta and Malevolence battle for the right to tutor and guide the Protege. The Protege demands to know who Aleta is and the two of them bond quickly. 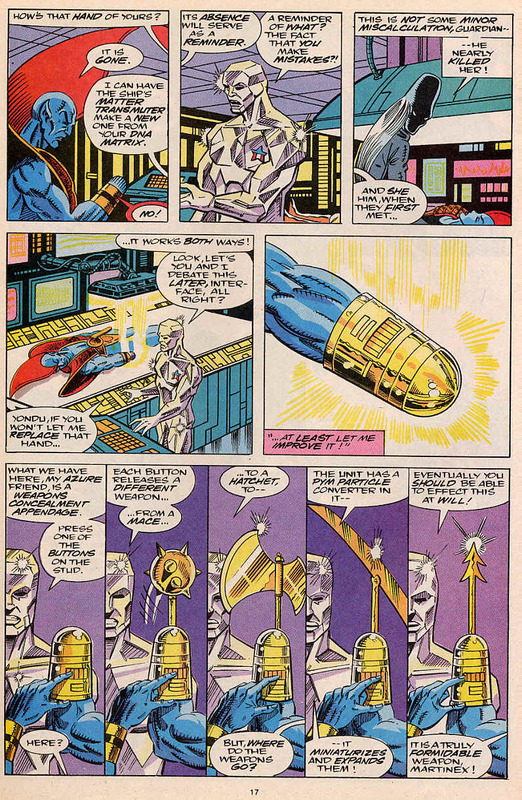 In sick bay, Photon is stablilised and Yondu’s missing hand is replaced with a golden stump, with hidden weapons. 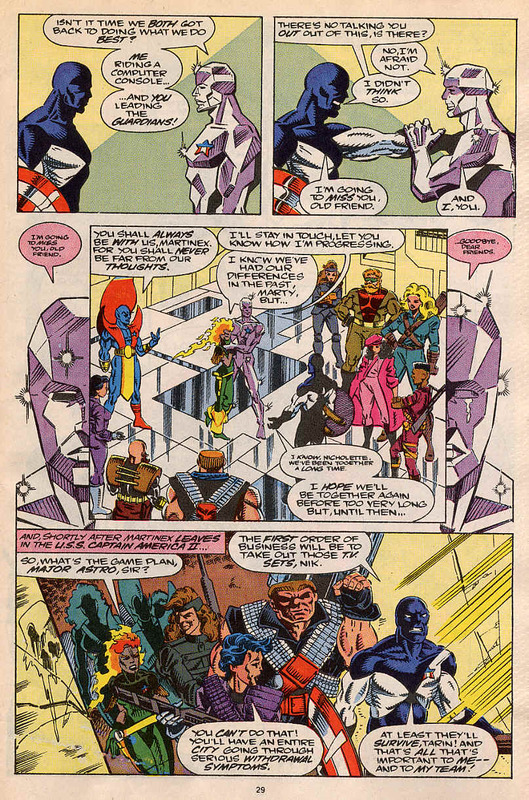 Things are getting tense, so Martinex and Interface talk about the Protege, his power and his origins. He was genetically engineered to be the new Magus and he has the power to absorb skills and powers on sight, meaning that the more powers and powerful he sees, the more powerful he becomes. If he should meet someone like.. Galactus. 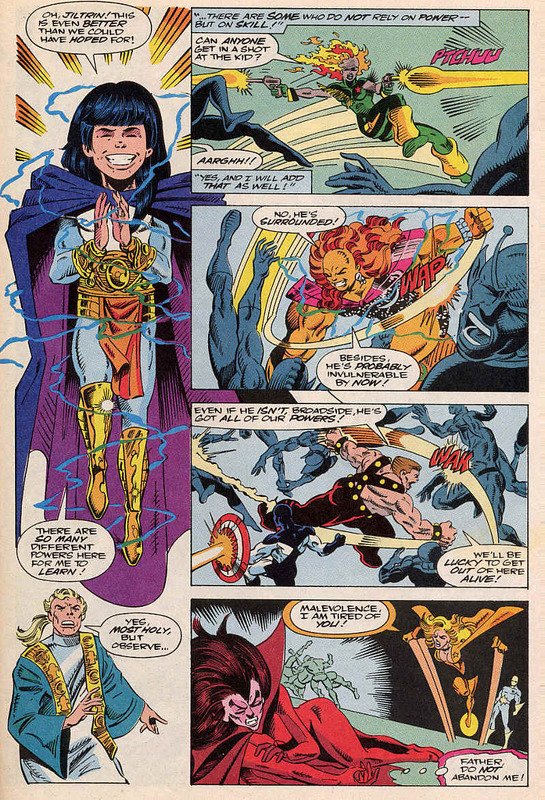 The two teams work decide to work together and stop the Protege, but due to the Protege’s powers, they shouldn’t use their own superhuman abilities. As this is discussed, Aleta continues to bond with the Protege, teaching him how benevolence and love are important to all, gods and mortals alike. 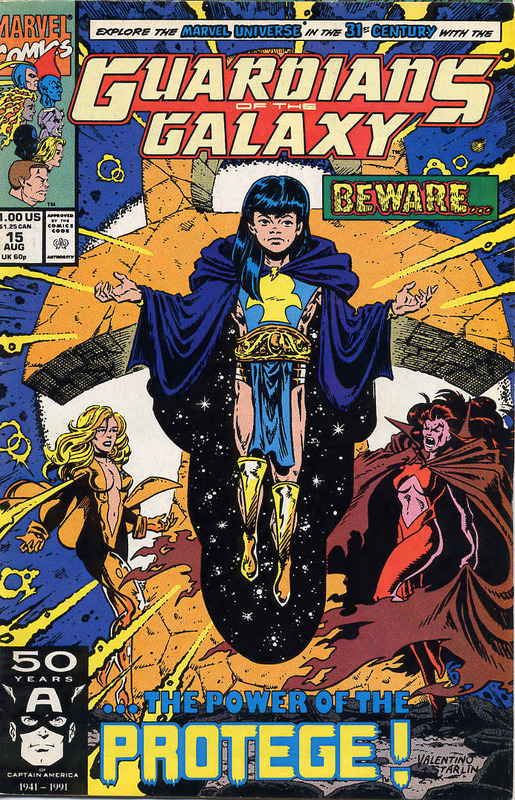 As she starts to get through to him, Malevolence points out that the Guardians of the Galaxy, mostly non-believers are on their way to attack him, calling Aleta a traitor. By the time the Guardians and Force teleport down to the planet (minus Yondu and Photon) the Protege’s guards are ready for them and a battle quickly ensues. Upon seeing the Protege in front of her, Replica bows in supplication in mid-battle. 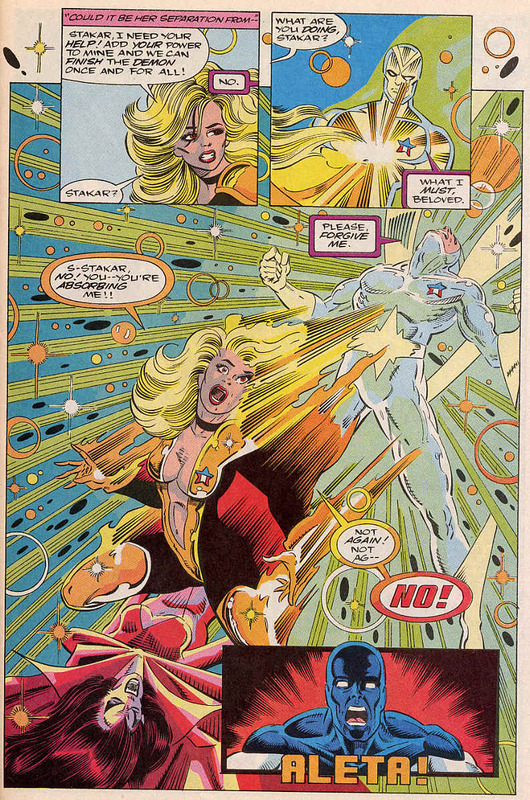 Martinex covers her in an ice dome, allowing everyone else to use their powers and the Protege observes and absorbs all the powers and skills of the attackers. By this point, Aleta loses it and attacks Mavelonce with ferocity. Seeing Aleta lose control and asserting that the child is her’s Vance becomes very concerned about her state of mind and rushes to help her see reason before she does something she’ll regret. He does get far, Aleta blasts him back and he’s left in slack-jawed amazement. 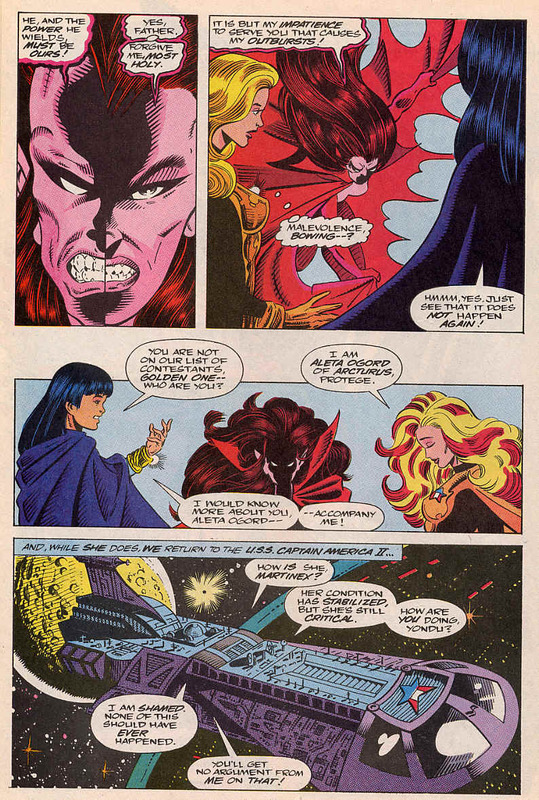 Just as Aleta is about to finish Malevolence, Starhawk appears behind Aleta and re-absorbs her. Begging forgiveness, he leaves, feeling that the re-absorbtion hasn’t gone as planned and something is wrong. 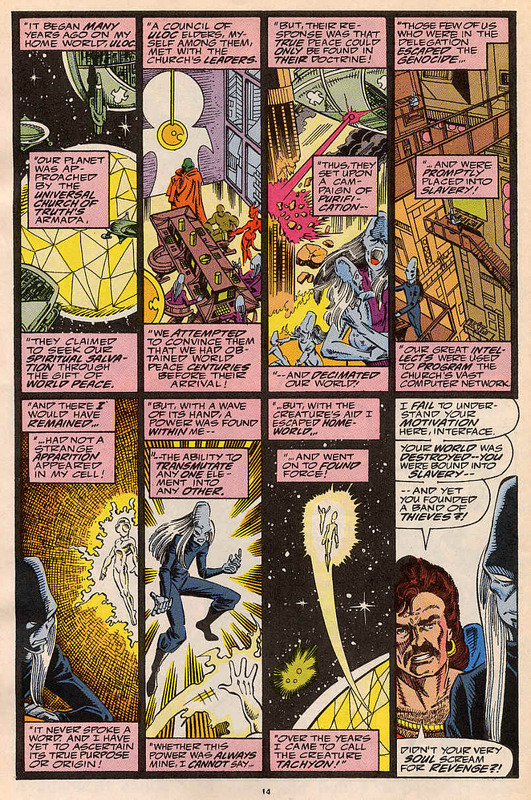 Facing the Guardians and Force, the Protege demands that Aleta be brought before him, wanting Starhawk’s location, since no one knows, he prepares to kill the Guardians until Replica begs for their lives. 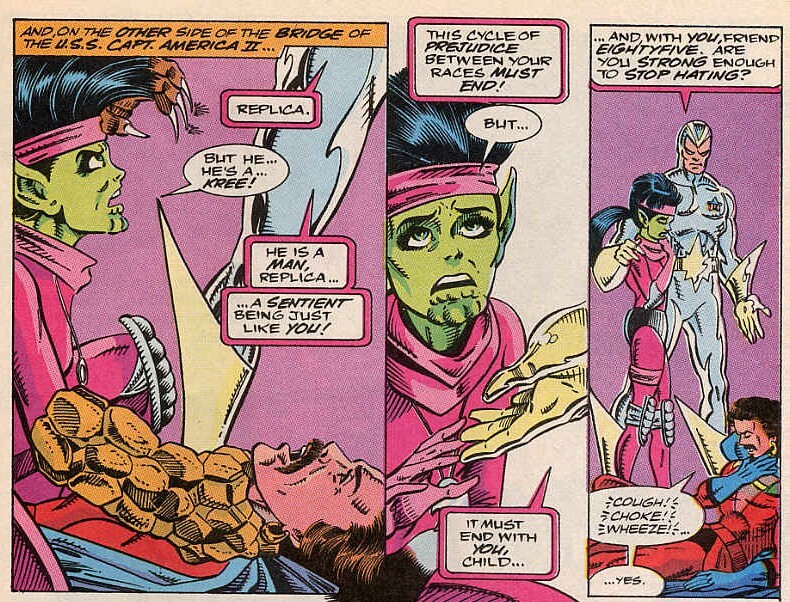 Offering to stay and be his friend to save them, Replica takes her leave of the Guardians of the Galaxy, saying her goodbyes to everyone, including Vance who has just lost the love of his life and the first happiness he had known in over a thousand years. The Protege banishes the Guardians and Force and declares Malevolence as his matricarch. The Guardians and Force say their goodbyes, with Broadside and Charlie-27 having a sweet moment. 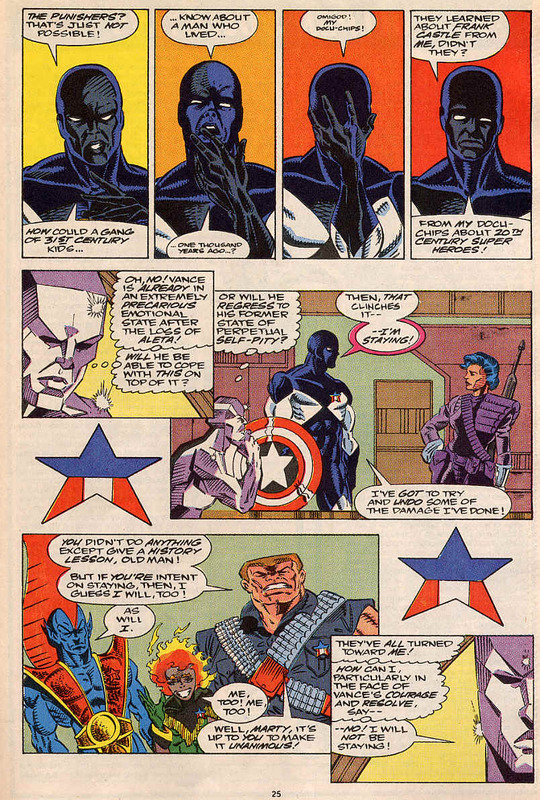 Force departs and in a very Fantastic Four moment, Vance Astro requests that he be taken back to Earth as he quits the Guardians of the Galaxy. 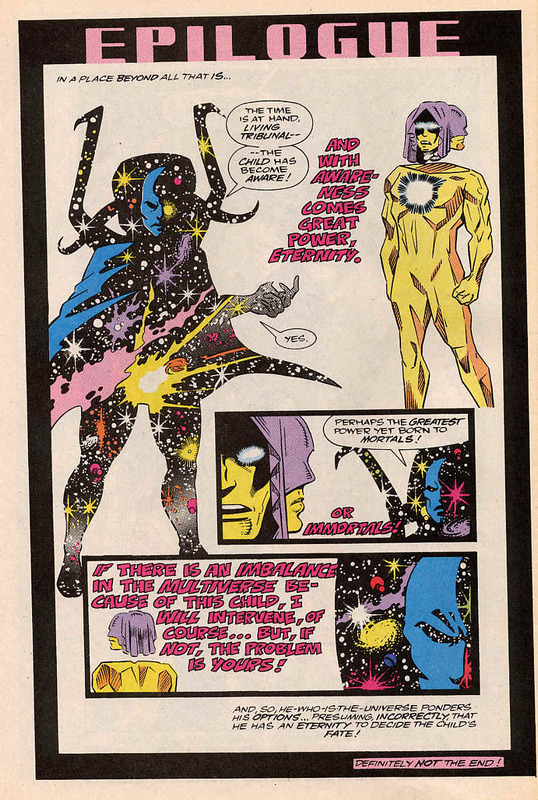 There’s little epilogue featuring the personification of Eternity and a mainstay of the Marvel Universe, the Living Tribunal, who discuss the threat posed by the Protege, but neither actually do anything, assuming it’s either not their problem, or there’s no problem as yet. Notes: I loved this issue when I first read it over 20 years ago and I still love it now, so much happens, lots of action and drama. This is one of Jim Valentino’s best issues, the team looks great and everyone has something to do, leaving nothing wasted. This issue is a strange comment on religion, with the Universalites searching for their god for so long, they just make one. 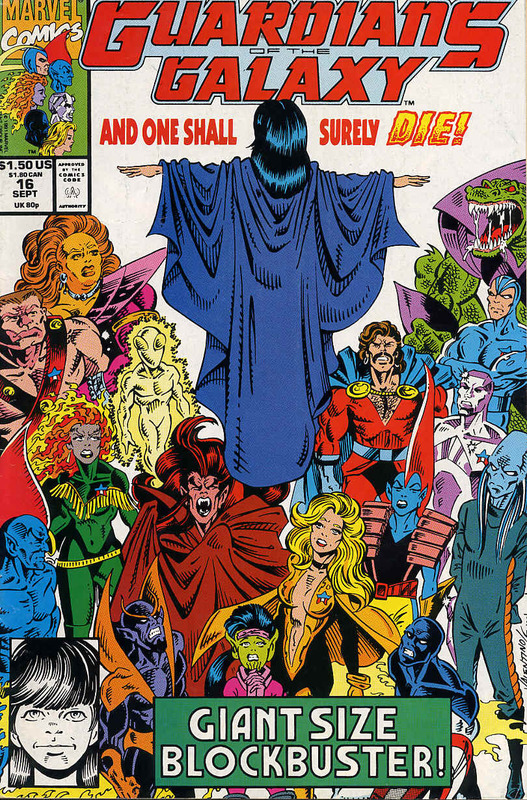 It’s less in your face than Jim Starlin’s take on the dark side of organised religions, but worth noting nonetheless. Despite Vance’s concerns, I don’t see how Aleta lost it as badly as he does. She was raised on a warrior’s world and is clearly quite a passionate person. She has also lost children in the past and feels understandably worried about the risks to this child she clearly cares for, being exposed to lets be honest Satan’s daughter. One thing that bothers me about the issue is that the teams go to Homeworld to stop the Protege and then without much protest just leave and everyone seems ok with this. Really? I don’t have anything to say here beyond just gushing about how great this issue was, but I can say that this is a real status change for the team for quite some time. 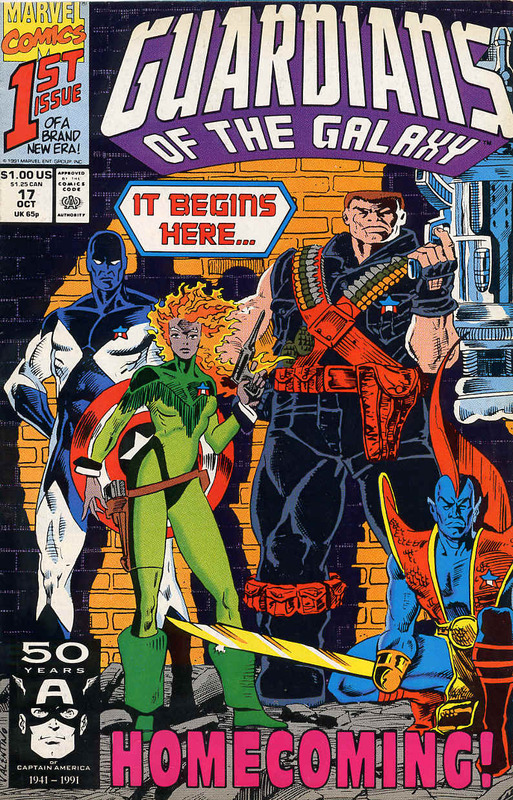 Guardians of the Galaxy 15 was cover dated August 1991 and was on sale in June 1991, sharing the spinner racks with Deathstroke: the Terminator #1, Fantastic Four #355, Jaguar #1, Solar Man of the Atom #1, Wonder Woman #57 and X-Force #1. 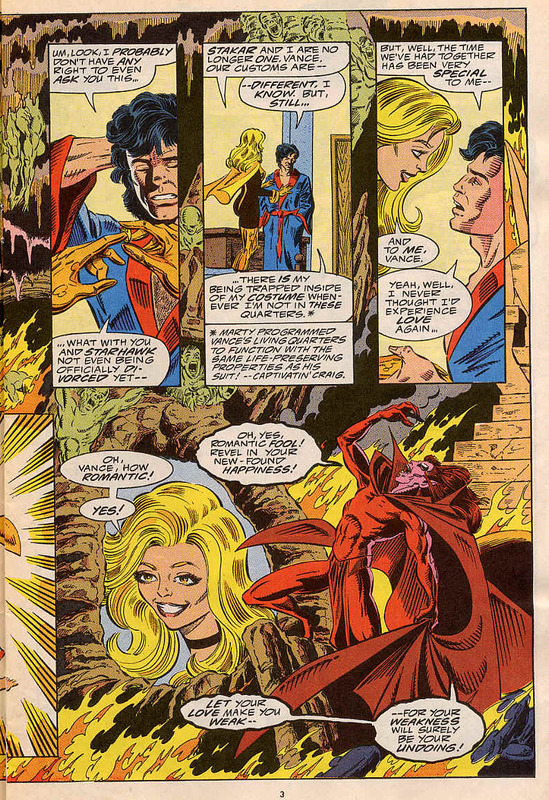 The Power of the Protege was written and drawn by Jim Valentino and inked by Steve Montano and opens with Aleta and Vance getting engaged under the watchful eye of Mephisto. 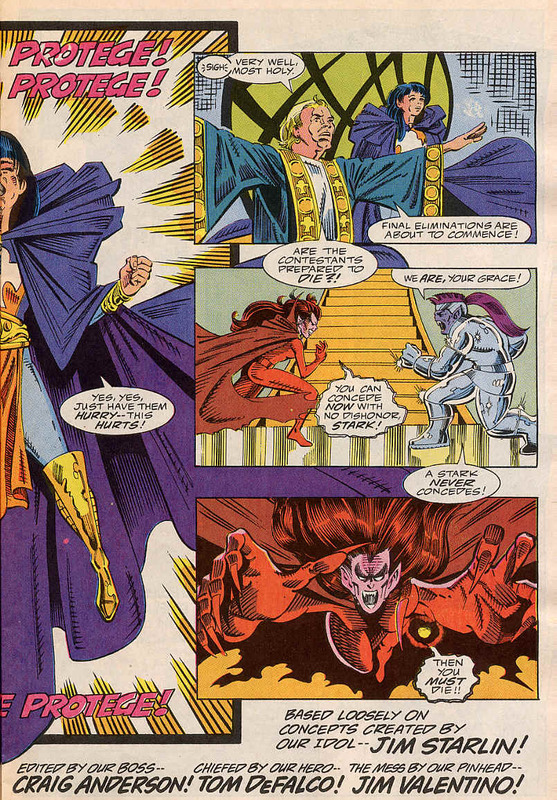 Mephisto, in his hell-like home monologues about the recent past, a nice bit of exposition and re-capping, with the added bonus of the little known fact that he assisted the Spirit of Vengeance in removing Starhawk’s memories. The scene shifts to the homeworld of the Universal Church of Truth and the presentation of the Protege, he who will be the new Magus. The Protege is overseeing a process to choose a matriarch, a woman who can guide him in the use of his growing powers and his leadership of his chuch. This process seems to be a last man standing combat competition, with females from across the known worlds, battling for the right to stand at the Protege’s side, including a Stark and the demonic Malevolence. While the Protege learns how to use the fire that Malevolence wields, Interface tells the rest of Force some of her history. She was born on Uloc, a peaceful world of intellectuals. The Universal Church arrived and forcibly converted the planet and enslaved it’s population. 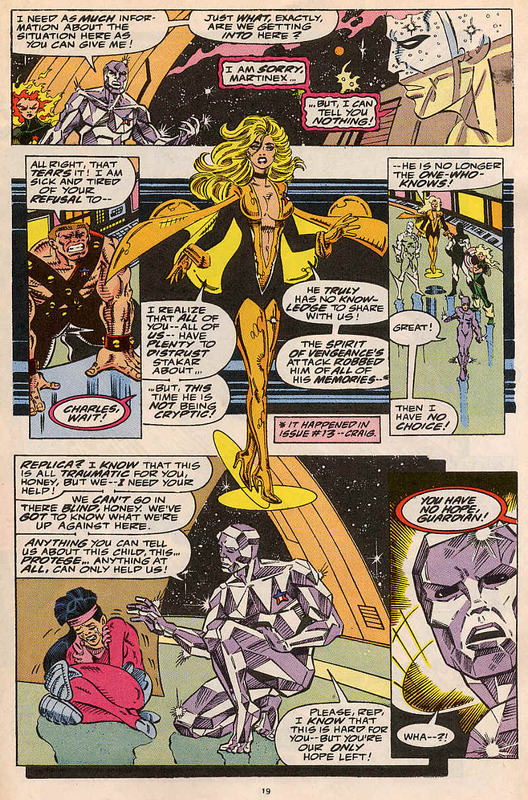 Interface was approached by the energy being Tachyon, who awoke in her the power of matter transmutation. They both left Uloc and she founded Force. As Eighty-Five questions her choices, Brahl returns and commands the rest of Force to prepare to attack the Guardians, whose ship is approaching. On the ship the team is getting ready to get to the Church’s homeworld and Replica, in fear for her mortal soul, cowers on the bridge. Vance arrives to see Nikki carrying pistols again and they wait for Aleta and Starhawk to arrive. Starhawk gives Aleta his blessing over her engagement and just for a second, things for the majority of the team look good. Well it’s a Marvel title, so we know that won’t last. The ship arrives at Homeworld and Martinex is looking for answers from an amnesiac Starhawk and a cowering Replica, when Force attack. 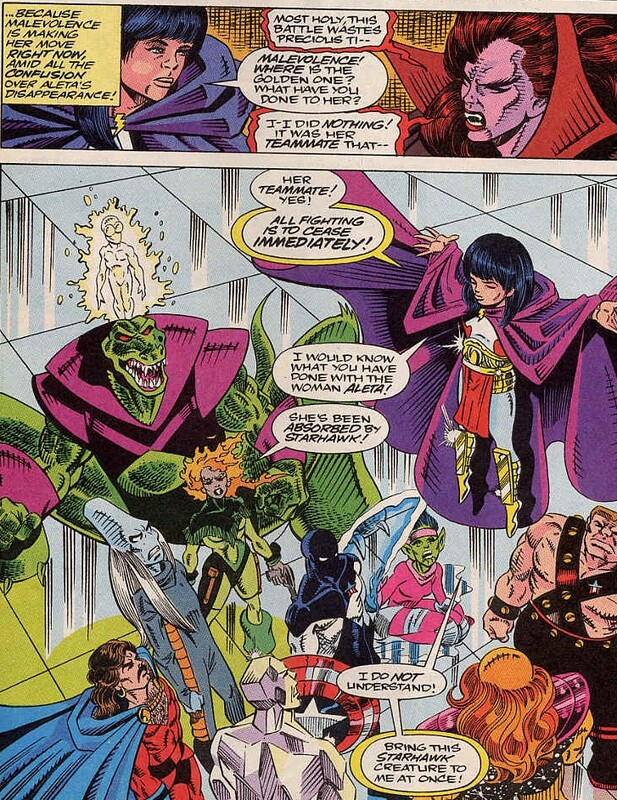 Once again the teams pair off, most of the pairings matching the ones from Guardians of the Galaxy #6. 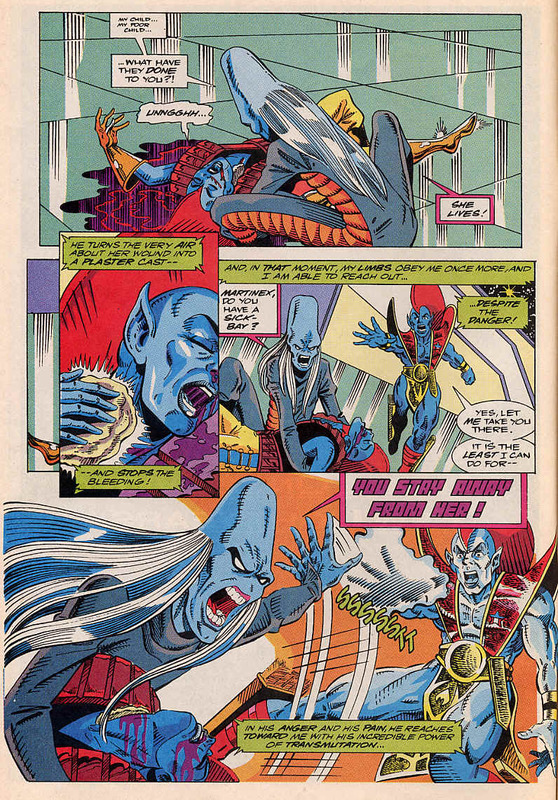 Scanner goes for Nikki, Broadside grapples with Charlie-27 and Photon seeks out Yondu, who has yet to show up this issue. 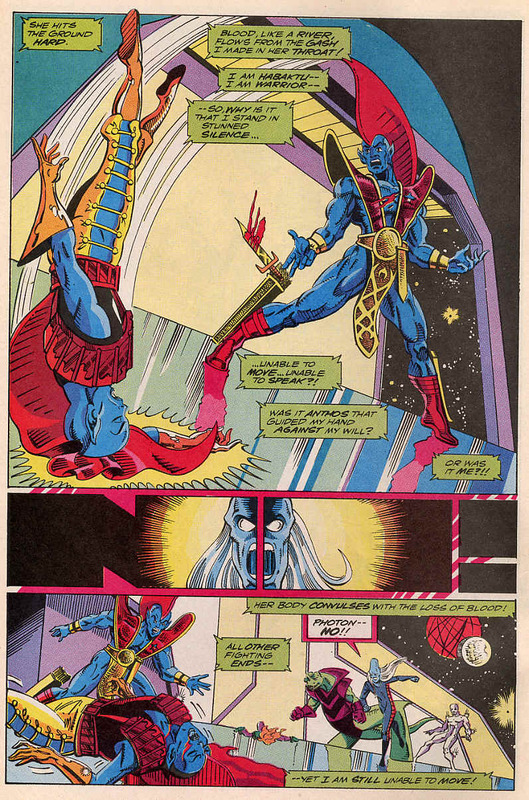 Photon finds Yondu, this time he is willing to fight. 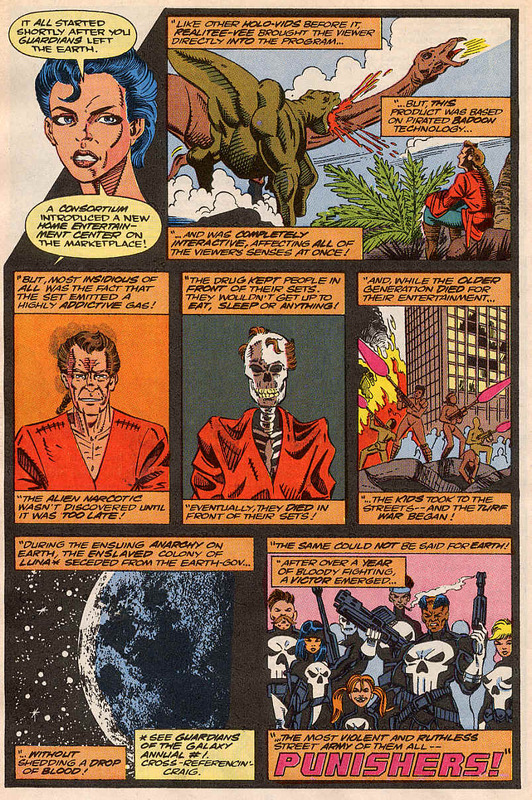 Photon tells of her life, how her eye-blast powers caused fear in the superstitious Centaurians and she was cast out, losing her mother and father to starvation and a mob respectively. 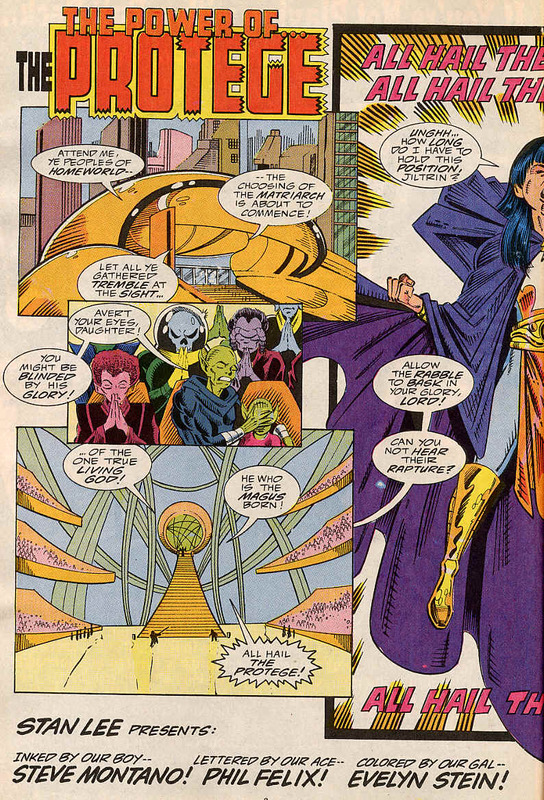 Photon was found by Interface and Tachyon, who raised her and she rejoiced at the devastation caused by the Badoon and forever abandoned the spiritual side of her nature. 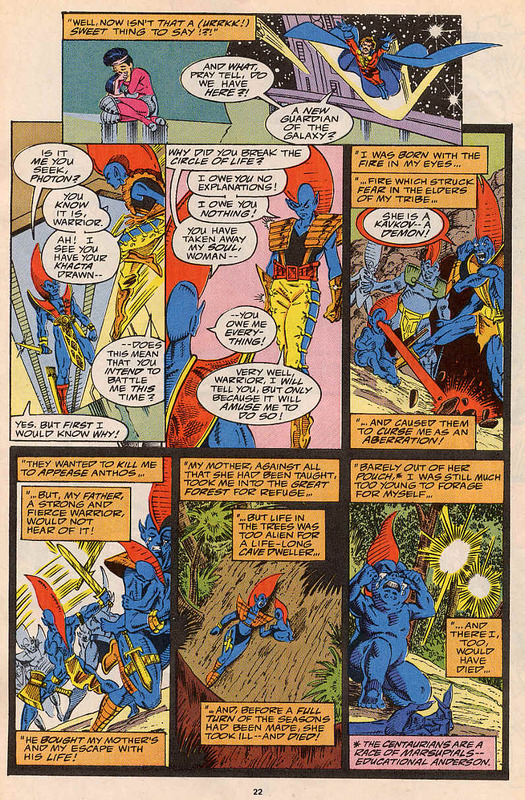 Yondu is understandingly taken aback. 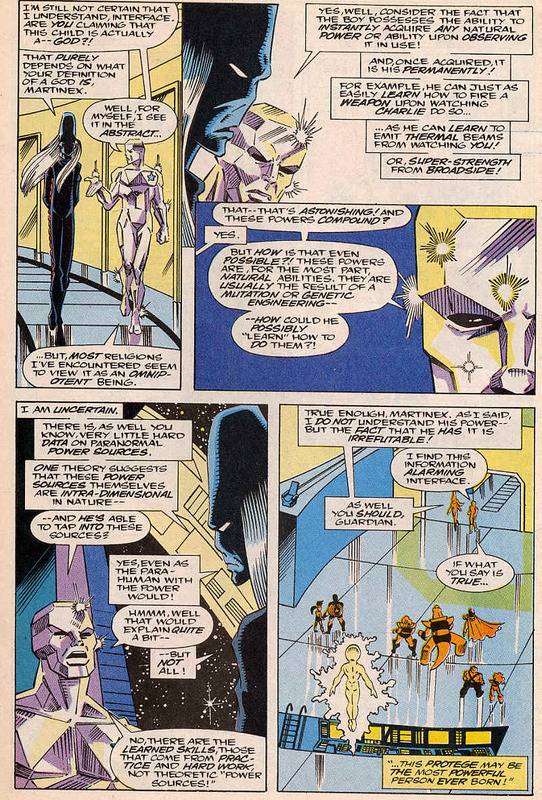 Tachyon stands before Vance and Aleta, Aleta teleports down to Homeworld. 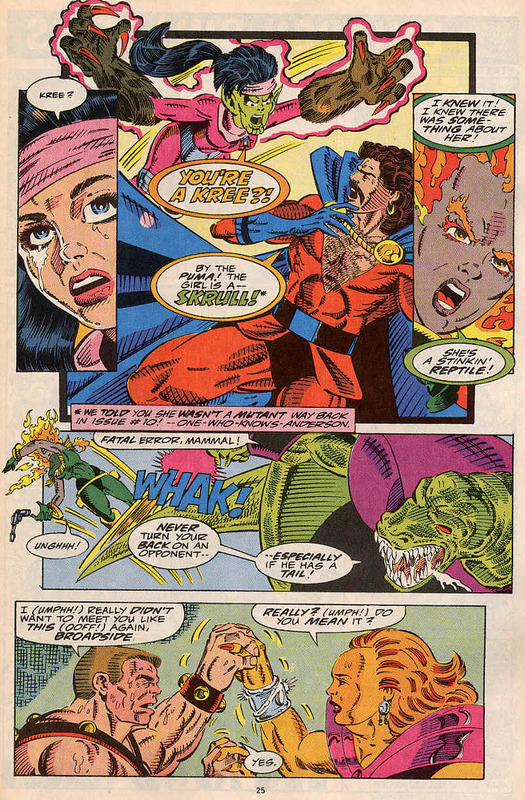 Brahl reacts badly, as he was there to prevent Aleta leaving. Unaware, Brahl is struck down by an almost immaterial Starhawk, who is as incorporeal as Brahl. Eighty-Five finds Replica and decides not to fight, uttering the words. 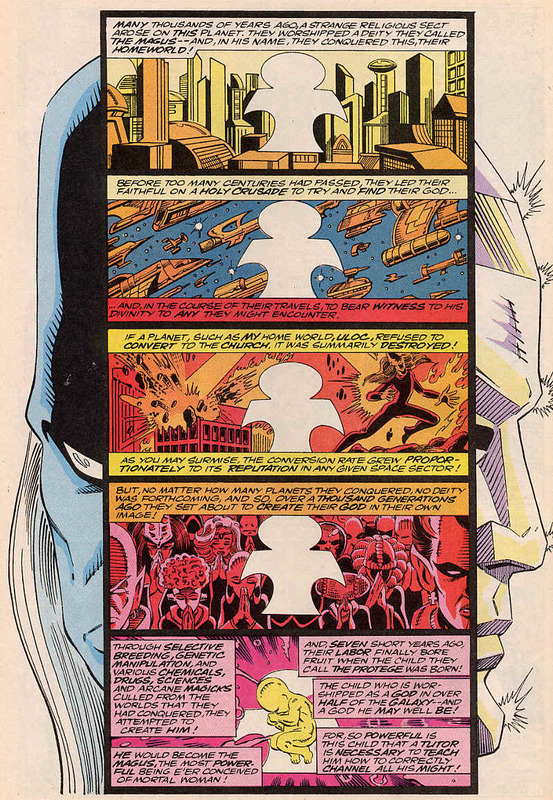 “Take my soul if you will Malevolence, the Kree do not war on children.” Which is how we find out where Replica is from. She’s a Skrull. 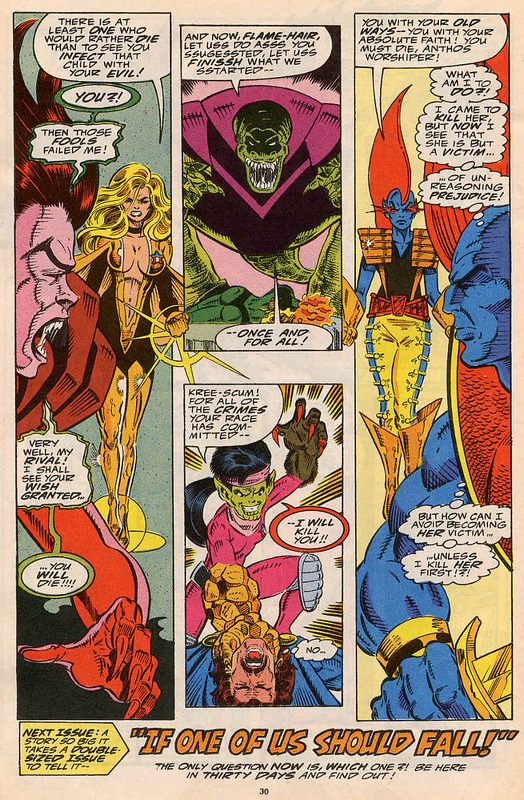 Skrulls and Kree have warred for millenia and in a fit of rage, attacks Eighty-Five. Aleta now arrives on Homeworld and challenges Malevolence, putting her life on the line to protect the Protege from her evil. Eighty-Five vs Replica, Scanner Vs Nikki, Aleta vs Malevolence and Photon vs Yondu. The Players are in place and the fight has just begun. Notes: I love this issue as the stories interweave well and the action is on a knife edge. With the exception of Malevolence and Brahl, even the bad guys have an understandable point of view. 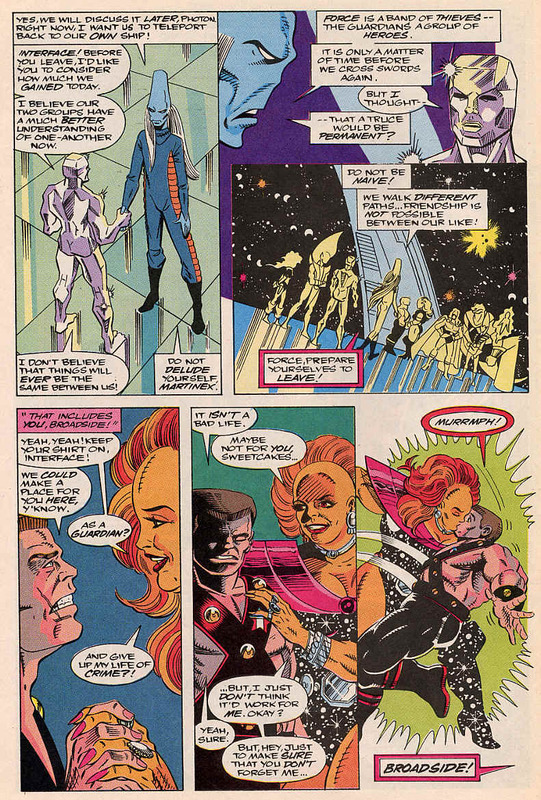 On the first page, it looks like Vance and Aleta are getting dressed, hinting at their relationship is getting more and more intimate, then Vance proposes. Charlie-27 and Broadside make peace in a charming two panel scene, it’s a shame nothing ever really comes of it. The Protege is the next Magus and is seeking a tutor, but only one good in a fight? 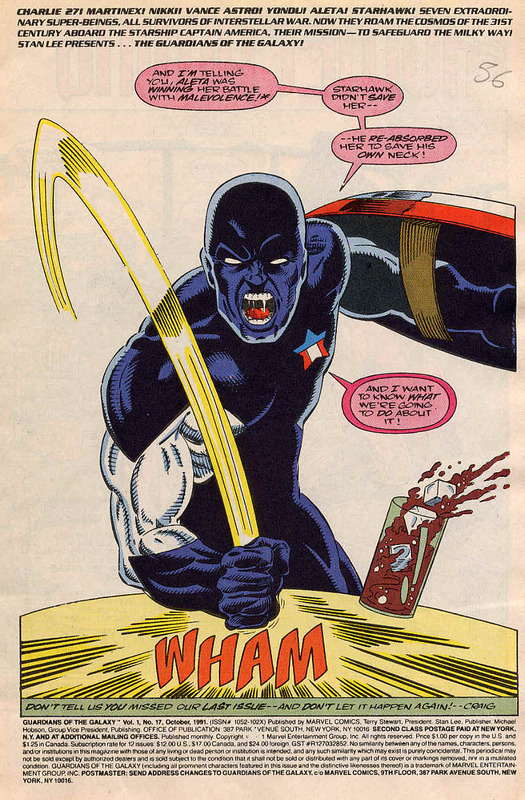 He also seems to be able to aquire powers and abilities upon seeing them in action. It has all come to a head, now what? Next time: Double length issue 16.